Masquerade parties or masquerade balls are elegant, and fun occasions, where you get to dress up, and wear something completely different. Masquerade balls and parties are events that have a certain dress code. Masquerade balls first emerged as part of the carnival festive season in the 15th century. After this, masquerade balls became more popular and were simply held as part of public festivities. Outfits are the most important part of any masquerade party, as they are essentially the main focus of the event. Choosing an outfit for a masquerade ball can be difficult, but it is much simpler, once you know what the essential items for a masquerade ball are. The most important part of a masquerade party outfit is the mask. Masquerade masks are available in a number of different types, styles and colours, and you can find masks with various features on them, such as diamantes and feathers. You can find stick masquerade masks, which usually only cover the eye area. These feature a mask with a stick, which you use to hold the mask over the face. They look great, but they are a little less practical than other types of masquerade masks. You can also purchase half face masquerade masks, which cover half of the face. These feature a bow, which you tie around the head to keep the mask in place. Half face masquerade masks are arguably the most practical type of mask. You can also find full face masquerade masks, which look great, but are arguably the most impractical type of mask, and eye masquerade masks, which cover the eye area, but feature holes for the eyes, and a ribbon that you tie, to keep the mask in place. Outfit: The outfit you decide depends on two things. Firstly, it depends on how formal the masquerade party or ball is, and secondly, it depends on what colour your mask is. If you are going to a high end masquerade ball or a classic masquerade party, it is a good idea to wear a floor length, vintage-style dress. If you are attending a masquerade party, then you may run with a knee high dress, or even a corset and a skirt. Make sure that the dress you choose isn’t too short. When choosing your dress, make sure that it compliments the colour of your mask. Shoes: Heels should be worn for masquerade parties and balls, as they look stylish and elegant. Keep your shoes simple, yet stylish, as you already have a dramatic mask, and an elegant dress, so you don’t want to make your outfit look too fussy. Shoes: Men should always wear formal dress shoes when attending a masquerade ball or party. These shoes should be in a neutral colour, such as black or brown. 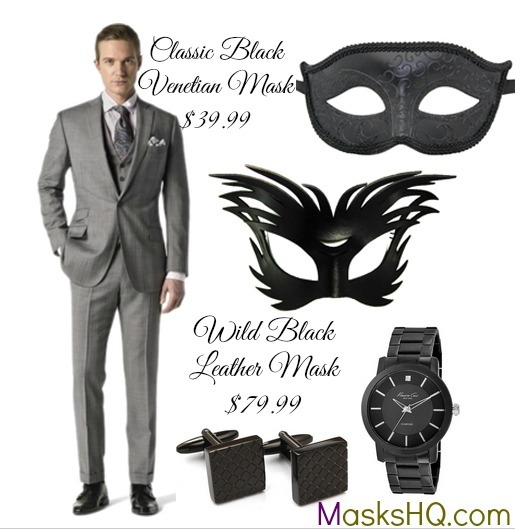 Outfit: Men should wear suits and ties to masquerade balls and parties. If you are going to a masquerade ball or a formal masquerade party, then you may want to wear a pocket square as well. Make sure that you choose a classic style suit, which is in a neutral shade, such as grey or black.